Learn about the importance of the sea for Figueira da Foz and Buarcos, Coimbra. 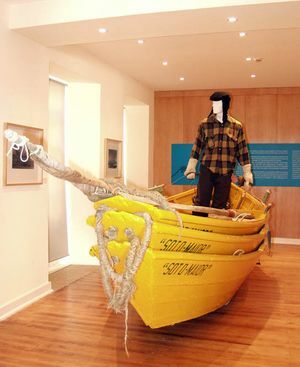 The Núcleo Museológico do Mar (Sea Museological Centre) of Figueira da Foz was opened in 2003 in the city of Buarcos, in the Coimbra district, Portugal, with the aim of recovering and disclosing the main historical and practical most identifying fishermen memories of Figueira da Foz. The second is focused in the cod fishing and the importance of this activity for the economic and sociocultural development of Figueira da Foz. The third area is linked to the artistic expressions of the fishing activities and the manifestation of faith with divine protection. The collection of this museum is completed with written, photographic and audiovisual document; and private and collective memoirs about experiences lived on the sea. Rua Governador Soares Nogueira, 32 Buarcos. Opening Hours in Summer: From Tuesdays to Fridays from 9h30 to 17h00. Saturdays and Bank Holidays from 14h00 to 19h00. Opening Hours in Winter: From Tuesdays to Fridays from 9h30 to 17h00.